No matter what electrical service you need,we will ensure that you get a successful result at a fair price!! Call on someone you can trust! Call EMI Electric Co. Welcome to Andrade Link Electric Corp Andrade Link Electric Corp, is a new electrical contractor business that provides with all kinds of services, and has taken many unique and complex project. We are based in the Bay Area, and have services available for residential home's and commercial business'. Here at Andrade Link Electric we take passion in our labor and customer service. Our team is dedicated to providing professional assistance in comprehensive and project management with consideration of critical time schedules and budgets. We are qualified and equipped to handle the challenges and complexities of any size job. OFFERING YOU THE BEST SOLUTION FOR ALL YOUR ELECTRICAL NEEDS. 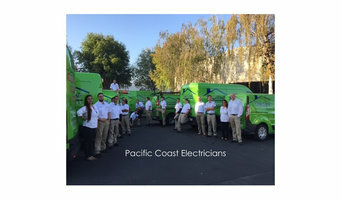 Count on us for the finest in electrical services including home and office automation, automatic standby generator systems, interior and landscape lighting, LED Lighting, TV Mounts, home theaters including audio and video distribution, electrical service upgrades, swimming pool electrical systems, telephone systems and wiring, data/computer wiring and so much more. Our electricians are trained to handle all aspects of residential and commercial applications with safety always our priority. At California Sparkies we have both the knowledge and experience to meet our customer’s demands – and we do so with perfection.